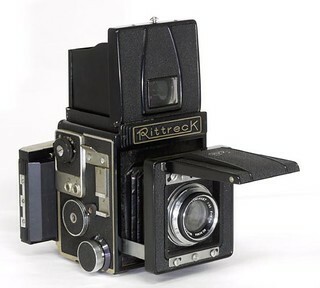 The Rittreck is a 6×9cm SLR without a revolving back, made from 1955 by Musashino Kōki. The most common versions are the Rittreck IIA and Rittreck SP. 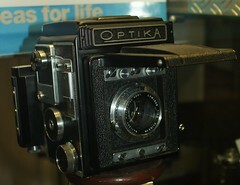 The Optika IIA was a name variant of the Rittreck IIA, sold by Seymour's, a distributor based in New York. Kamera no ayumi. Zen nihon shashin renmei sōritsu 50-shūnen kinen (カメラのあゆみ・全日本写真連盟創立五〇周年記念, History of cameras, commemorating the 50th anniversary of the All Japan Association of Photographic Societies). Tokyo: Asahi Shinbunsha, 1976. No ISBN number. P.104. Lewis, Gordon, ed. The History of the Japanese Camera. Rochester, N.Y.: George Eastman House, International Museum of Photography & Film, 1991. ISBN 0-935398-17-1 (paper), 0-935398-16-3 (hard). P.94. McKeown, James M. and Joan C. McKeown's Price Guide to Antique and Classic Cameras, 12th Edition, 2005-2006. USA, Centennial Photo Service, 2004. ISBN 0-931838-40-1 (hardcover). ISBN 0-931838-41-X (softcover). P.705. Sugiyama, Kōichi (杉山浩一); Naoi, Hiroaki (直井浩明); Bullock, John R. The Collector's Guide to Japanese Cameras. 国産カメラ図鑑 (Kokusan kamera zukan). Tokyo: Asahi Sonorama, 1985. ISBN 4-257-03187-5. Items 2249–50. Rittreck IIA serial no. 2537, with 105 mm f/3.5 Luminon, sold at the auction no. 15 (May 2009) by Westlicht Photographica Auction. Rittreck IIA serial no. 8673, with 90 mm f/3.5 Luminon, 105 mm f/3.5 Luminant and 210 mm f/4.5 Luminant, sold at Westlicht auction no. 9 (May 2006). Tele-Luminant 40 cm f/5.6 serial no. 41827, also sold at Westlicht auction 9. 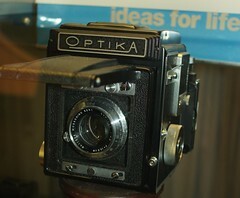 Rittreck IIA, lot no.371 of Foto Hobby Rahn Photographica Auction no.5 (12 May 2007). This page was last edited on 12 October 2015, at 10:45.